If you follow my writings, you know that I don’t use Apple Music for my main music library, but do use it on a test library on my MacBook, as well as on an iPod touch. I recently added it to my iPad as well, to be able to use it more around the house. I don’t trust my main library to Apple Music because of the many problems that iCloud Music Library causes. As I’ve been adding music to my library, I’m realizing just how bad Apple Music’s metadata is. Here’s an example. I wanted to listen to some Frank Sinatra. There’s a big set called Ultimate Sinatra, with more than 6 hours of his music. So I added it to my library. When I started listening to it, I noticed that I wasn’t hearing all the songs that I knew. I looked at this album in iTunes, and I was surprised to see how it displays. This is a single album, yet iTunes shows it as a number of different albums with different titles. I’ve sorted by album so each title should be grouped, but you can see there are four different titles for tracks in the first grouping. And that first group of tracks, which is hanging together as an album, has track numbers in a seemingly random order. Frank Sinatra is listed as the artist for all these tracks, sometimes with others. But if I view this album in a playlist by Artist, the only artist listed is Cole Porter. 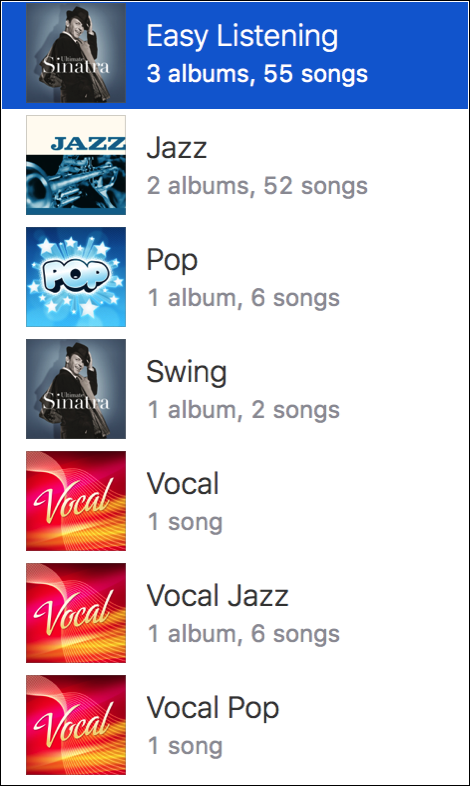 An Hour with Harry James is the title of two “albums,” and one – whose tracks show as being in the cloud, but which are unavailable (see the first screenshot above), is called Ultimate Sinatra. And if I view Frank Sinatra in the column browser? There seem to be a lot of albums, many of which don’t display in other views. Here’s what I think is happening. I’ve seen that iCloud Music Library changes tags and artwork. Rather than assuming that your tags, the ones you may have manually changed, are canonical, it just decides what the tags should be on your music. For example, yesterday, I deleted composer names in all the music in the Rock genre in my library. I don’t care about composers for that kind of music; those tags just get in the way when I browse using the column browser. But, today, all the composers are back for those songs. So as iTunes updates your library, comparing it to music in the cloud, it re-matches files and changes tags. 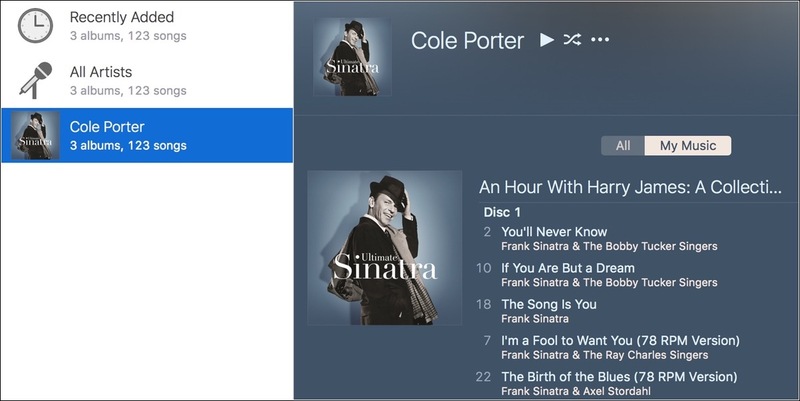 When I first added the Ultimate Sinatra album to my library, it was a single album, but it changed after a while. I surmise that iTunes matched the tracks and found that many of them were on different albums. Just as iTunes often matches tracks from studio albums to “best of” albums, here, it’s matched some tracks to the album I downloaded, and other tracks to whatever iTunes found first. But, of course, iTunes shouldn’t match Apple Music tracks; it only matches your music, that you’ve ripped or downloaded, and added to your iTunes library. This is terribly wrong, of course. Not only should iTunes not change metadata that I’ve edited, but tracks added from Apple Music, or downloaded from the iTunes Store, should have a unique track ID that can be used to prevent this. It’s very possible that deleting this album and re-adding it to my iTunes library will resolve these issues. I’m going to wait a few days and see if anything changes, then try that. But I shouldn’t have to. This is music from Apple Music, not music that I’ve ripped and matched. This is yet another example of how messed up Apple Music is. It’s fine if you want to stream Taylor Swift, or listen to Beats 1 Radio, but once you start building a library, it’s simply a mess. The only thing I can conclude is that Apple is not using the same database for Apple Music as they are for matching songs with iCloud Music Library. After adding this album to my library, which used Apple Music metadata, iTunes check with iCloud Music Library to match the tracks, and changed metadata. Feel free to post your examples of messed-up metadata in the comments. Update 2: A few days after the first update, I deleted the album, and then re-added it from Apple Music. I wanted to see if the tracks would remain as they displayed in Apple Music, if, perhaps, my initial experience was a fluke. It’s interesting that the entire album now matches to a different album, but one that showed up earlier, with different artwork. The only artist listed this time, when I view it in Artists view, is Frank Sinatra, however, and all the tracks are grouped within this single album. When I view in in Songs view, with the column browser visible, it shows 1 different albums, whereas previously it showed eight. Four artists are listed, plus an entry for Compilations, which contains just one song by Tommy Dorsey & His Orchestra, and the music spans eight genres. I agree with all of this, but my request is simple: I want to see my lists (artist, album, song…) sorted properly. On my 6S, view my music by artist, and I see all my music sorted by artist’s name. View by song, and I see all songs, sorted by song title. Sort by album and I see all albums, sorted by…. artist name? The entity submitting the song to iTunes sets these attributes NOT Apple. And what does Apple Music do when I try to add this playlist to my iPhone from my Mac?? Deletes everything I have added from Soundcloud et al and replaces a huge number of tracks that I have stored on my Mac!!! So I end up with different versions of the song I OWN on my playlist and the playlist switches to downloading these shite versions that I don’t want from the cloud when I have the versions I want right on my Mac…. It is a *** storm encompassing a *** sandwich inside a *** house. *****. As far as Apple Music is concerned it can *****. I’d be as annoyed as you (Boris) had that happened to my library. Luckily, I didn’t jump in, waited, saw that personal metadata was being interfered with, and knew I’d steer clear. Apple can’t undo this. Once trust has gone, that’s it. Off topic but I absolutely hate (Deluxe) everything album titles. I can almost bet they count both the regular and deluxe titles as two albums and double count all tracks available in iTunes store. Realistically, aren’t these problems with metadata and overlapping databases simply too complicated to fix? As I read Kirk and the comments, the issues simply seem too intricate to be resolved, especially retroactively. Frankly, it seems insoluble. I would like to see the possibility for users to flag tracks that are incorrectly matched, to provide information to get the correct tracks, which would help apple fix this problem overall. That might be difficult to implement, but, as things are now, there is nothing at all that users can do. What if there was a different remaster? You can only match to one. What if there is no album name? iTunes Match uses digital fingerprinting, so it can identify such differences. Apple Music, however, only match is metadata. So if you’re metadata is bad, you will get bad matches. My metadata is good. I’d happily pay an extra 25 a year for that to work. Are you saying if I do, the problems will be solved?? Listening to pink Floyd the wall on my iPhone that got matched in the cloud, and another brick in the wall part 2 is a live version completely unrelated. How can you break an album like that???!!! Listening to a live phish show I got at a phish concert, Halloween Vegas 2014, where set 2 they covered a Halloween album, one song called timber – all the rest of the songs that had names that did not match phish songs were uploaded and played fine, but because phish also has a song timber (different lyrics, length, album) I get that song instead on my iPhone. Stupid. I’d like to see someone do some reporting on these issues from a relational database point of view. I suspect the entire problem is that songs lack unique identifier keys, and even thinking about how to either do this or how to think about implementing it starting today is a head-splitting nightmare. Instead, matching is done on things that arent unique. The whole system is evidence against Intelligent Design. We adapt the best we can, but I suspect we can’t get to ideal from here. We also can’t go back to the beginning. One thing I discovered when analyzing the database on an iPhone is that there is a unique ID for artists, albums, and tracks. There has to be, as far as the iTunes Store is concerned. So it is very surprising how they make this kind off mistake. The unique ID should have prevented the problem I describe here, but it wouldn’t ensure that the correct version of a song is found when matching CD rips or downloads. I ran into this article while looking for a list of genres as they appear in iTunes Producer…. yet another thing Apple doesn’t match up on… the genres (for distributors) who use iTunes Producer… are completely different than the genres being displayed on the itunes store –– Anyway, I wanted to help you with your tagging problem. Your best bet is to edit the tags (if you’re on a Mac) with Qoobar BEFORE adding them to itunes –– You can download qoobar at http://qoobar.sourceforge.net/en/download.htm –– Otherwise, if your music is already on iTunes, then remove it, tag it with qoobar, then re-add it to your library. Kirk – do you think Apple even cares about fixing the metadata issues in iCML? Or do you think they view this as a power user issue and not worth their time to fix. Tough question. My guess is they think it only affects a small percentage of users, but also that it’s such a vast problem that they don’t even know where to start. That is odd. It happens on multiple iOS devices? In that case, it’s the cloud database that’s messed up. You could try removing the tracks from your iTunes library, waiting a while, then re-adding them to see what happens. I think it is time we revisited this article. While the 1st 6 months of Apple Music and the iCloud Music Library were rocky, my experience for the last year has been stellar – and iTunes ability to now work with my 24×96 sources and make lossy versions for the cloud has been insanely good, as it allows me to keep a lossless library int iTunes at the fidelity I record shows at and have it seamlessly flow to my iPhone. I couldn’t ask for a better celestial jukebox…. On my iMac I have a large, curated iTunes library, consisting of over 80,000 songs and many playlists that I’ve been gradually building since 2002. I’m enjoying Apple Music and the recommendations it is making. Based on Kirk’s advice, I turned on iCloud Music Library only on my iPhone, and left it off on my iMac. But that has some limitations, namely the inability to add new tracks to my existing playlists. As a result they are frozen in time. I’m also unable to sync them any more to my iPhone as you can’t manually sync music once iCloud Music Library is on. So I’ve made several backups, and I’m going to turn iCloud Music Library on on all my devices and my iMac. I’ll report back on how I make out. I feel your pain. I have over 25,000 rap songs, and ITunes Apple music don’t care about the producer, nor spelling the artist name the same throughout the library. I use musosis, which is a mapping service that does not alter your files, but provides the detail on vocalists and producers the others don’t. It has some cool features like, filter by IsExplicit and Songs I don’t have by. Sorry only for rap music at this stage.